Making scones is something I relish and love dearly. It is one of my favorite things to make and bake. Using my hands to rub the butter into the flour is the utmost relaxing thing for me to do in the kitchen, apart from rolling out dough. I’ve made hundreds of scones, possibly even thousands, and most of them I have made by hand. I make them with the stand mixer from time to time and usually give that option in the instructions of a recipe, but I always prefer playing with my food. There is something about working with my hands, many people know exactly what I mean here, it is blissful and child like. Think play dough, dirt, fun, gardening, those types of feeling come up when I’m having fun in my kitchen. I’ve been reading many books by Louise Hay, and she posts tons of affirmations and inspiring quotes that have me inspired in the kitchen as well. A recent and favorite affirmation I read, “We do not work in the kitchen, we play.” That was a latest post from her book, and it was a light bulb moment for me. I resonate with that so much in that I do “work” in the kitchen, yet I have changed how I have been saying it, mostly because I love it so much. Simply changing the word from work to play has released the stress engrained in the word work. Although most of my “work” involves the kitchen, it’s so not “work” for me. It is a joy, fun, and I get so much enjoyment out of playing with food in the kitchen and creating these recipes I love so much for you. It is much more than “work”, it’s a world I want to keep in happy thoughts and good spirits. So I am changing my brain about it, it’s a place to create! This recipe is easily made gluten free, simply swap out the whole wheat flour for a gluten free option. This is a very mildly sweet scone. I did not add any sugar, the dates and orange juice sweeten the dough ever so slightly. If you enjoy sweeter scones, add a couple of tablespoons of sugar. Place almond meal, whole wheat flour, baking powder, cinnamon, salt, and baking soda in a large bowl, whisk to combine. Whisk buttermilk and orange juice together to combine. Add butter cubes to flour mixture. Using your hands, rub butter into flour until small pieces are formed. Add dates, use spatula to combine. Add buttermilk, using a spatula, mix very gently to combine. Press mixture into bowl, very gently. Remove 1/2 of mixture and place on a lightly floured counter. Making a 1inch high round disk. Repeat with the other 1/2. Using a bench scraper or large knife, cut in into 8 even pieces. Repeat with other 1/2. Place on small cutting board or pan, place in freezer for 30 minutes. Remove from freezer, brush with egg wash, place in oven and bake for 23-25 minutes. Place on cooling rack until cooled. Enjoy immediately or place in an airtight container for up to 3 days on counter. To be honest, I have never tried. From my professional experience, I would say because it has little to no protein and the texture is so different, it won’t be the same texture in the end product. But I would say you should totally try it! It can’t hurt to try! I love scones and I don’t bake them enough. Almond meal sounds absolutely amazing in them too. I’m going to have to give this a go soon. Yes, almond meal is the best! 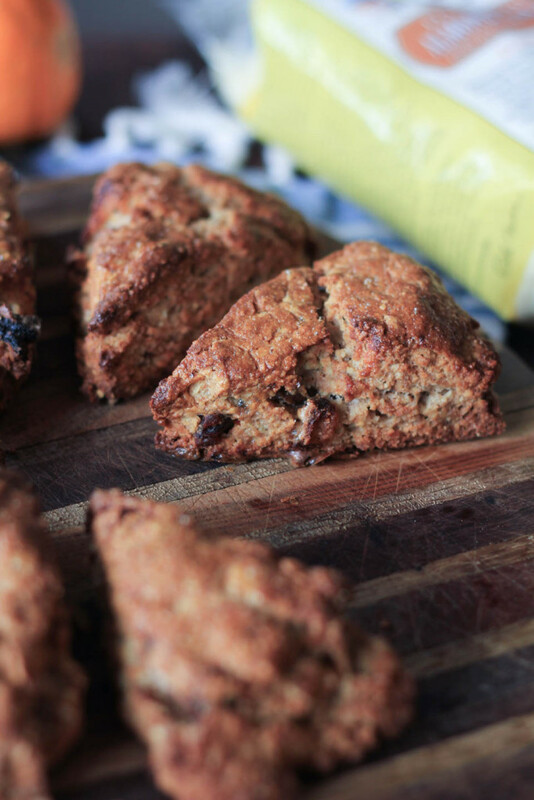 There’s not much better in life than homemade scones! Loving this flavour combo, I really should bake with date more often! I thought the same when I was adding the dates lol! Thank you! I’ve made and eaten soooo many kinds of scones (coming from Scotland, that’s kind of what we do) 😉 but I’ve never had scones like these! They look great! Love anything with almonds! these sound delicious! 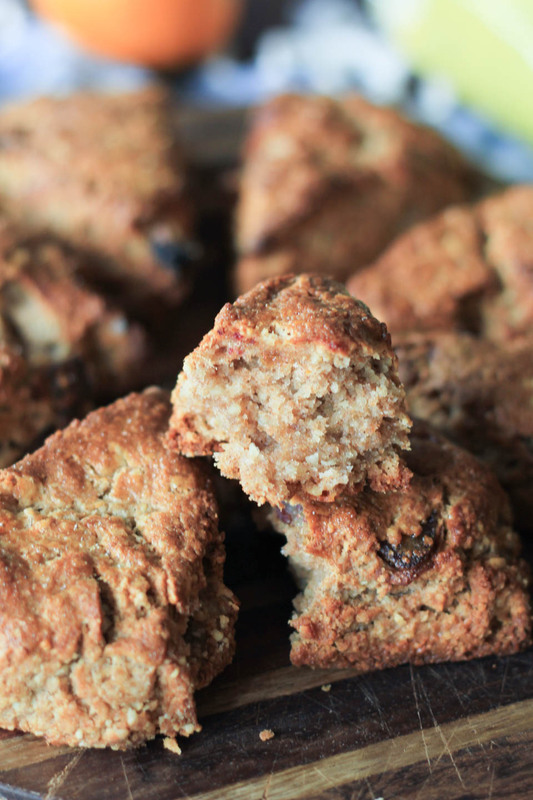 Oh, I love scones – my breakfast weakness. With almond meal and dates? Swooning over here! I completely agree about making scones. Something about that process is so comforting and satisfying. 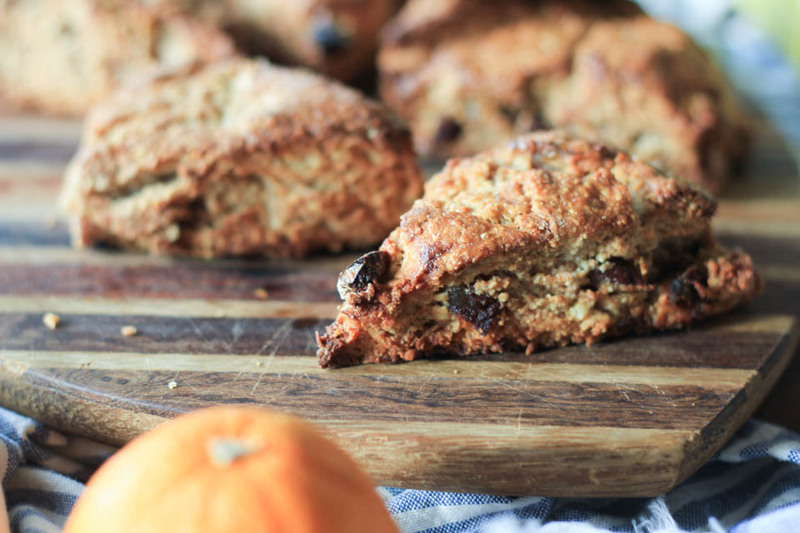 LOVE almond meal based scones for that coarser texture and heartiness and the brightness from the orange in these sounds perfect to balance that. <3 great recipe! Exactly, these are much heartier than the white ones :). 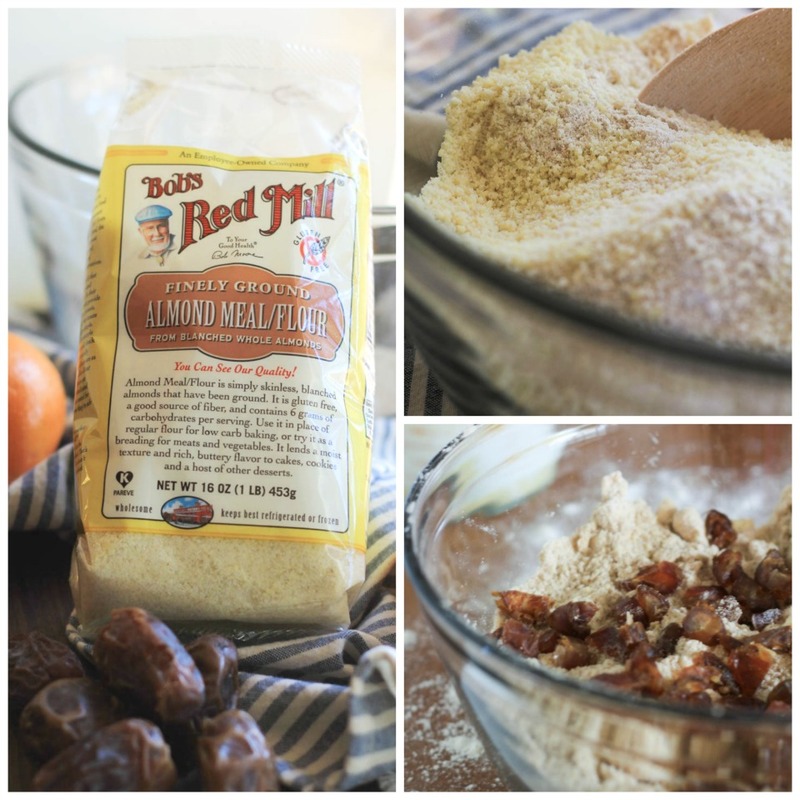 I love me some Bob’s almond meal and I just posted something today with it too! Your scones are lovely! Thank you, Carolyn!! Love your recipe! I absolutely adore these. I appreciate that they aren’t overly sweet because I like to slather my scones with jam! The date/orange combo is gorgeous!! Ohhhh I don’t do that, but I am so trying it! Sounds yummy. Thank you :). How beautiful are these?! Healthy too! Win! I think the most relaxing thing for me to bake is . . . cookies, but probably just because I like to eat cookie dough, lol! I definitely need more scones in my life though! These look amazing! Still going strong! Thanks lady xoxo.